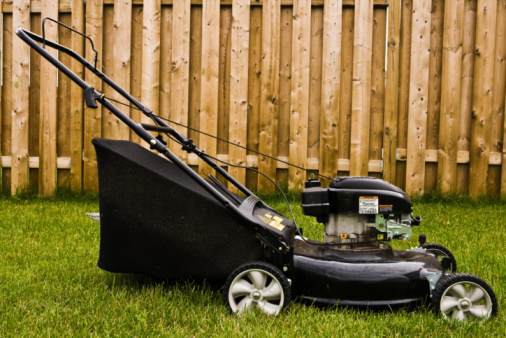 Loose lawnmower blades are unsafe and cause damage to your mower. Mower blades must be securely fastened to the mower shaft. The best way to tighten your lawnmower blades is with a torque wrench. Torque wrenches have a gauge showing how many foot pounds of pressure you use to tighten the securing nut. These wrenches are available at home improvement and auto parts stores. Tip the lawnmower on its side with the oil fill tube pointing toward the sky. The oil fill tube is where the oil cap is for checking the oil. Wedge the 2- by 4-inch block of wood between the bottom of the lawnmower deck and the back of the mower blade. This helps prevent the blade from moving as you tighten it with the wrench. Attach the appropriate size socket to the torque wrench for the securing bolt. Most lawnmowers require a 9/16-inch socket. Adjust the setting on the torque wrench to 30 foot pounds; use the directions that come with the wrench to perform the adjustment. Hold one end of the blade with one hand and place the socket over the securing bolt with the torque wrench. Tighten the securing nut with the wrench until the wrench clicks one time. The clicking is the setting of 30 foot pounds. Remove the block of wood and set the lawnmower back on its wheels. Park the riding lawnmower on a level spot in the yard, driveway or garage. Raise the mower deck to its highest position. Turn off the lawnmower and pull the ignition key out of the ignition. Grab one end of the blade you are tightening with your hand. Position the socket over the securing bolt and tighten with the torque wrench until you hear the one click. Repeat the process for the blade on the other side of the lawnmower deck.